Plantar plate tears are a very common injury that has been diagnosed more frequently in recent years as more research has been done in this area. I was very lucky to receive part of my residency training with the Weil Foot and Ankle group in Chicago, as they are in the forefront of research in this injury and actually developed one of the more common surgeries for this ailment. Plantar plate tears most commonly affect the 2nd metatarsophalangeal joint (where the 2nd toe connects to the foot), although any toe can be affected. They can occur from a traumatic incident such as a stubbing or twisting injury while running or hiking, but are usually due to a progressive injury overtime resulting from faulty foot biomechanics. They are most commonly seen in someone with a long second metatarsal. Symptoms of a plantar plate tear include pain at this joint with activity, and many times the toe will start to “hammer” or “float” and may no longer touch the ground in severe cases. The toe can also drift in the transverse plane. Conservative treatment for plantar plate injuries has had some success in select patients and include immobilization, stiff soled shoes, NSAIDS, and most commonly taping/splinting the toe down. If conservative therapy fails there is a common surgical procedure to correct this injury. The sooner this injury is recognized, the more likely that the patient will not develop a longstanding deformity and that conservative treatment could be successful. What are the biomechanics behind the plantar plate injury? The plantar plate is a fibrocartilage tissue that connects the metatarsal neck to the base of the toe at the bottom of the foot. It is the main stabilizer of this joint in the sagittal plane. Patients with a long 2nd metatarsal are more likely to develop a plantar plate tear as the plantar plate has to obtain more pressure, weakening it overtime and making it more susceptible to injury. A bunion deformity can contribute to developing a plantar plate injury as well, again leading to increased pressure at the 2nd MPJ. Plantar plate tears are often a clinical diagnosis after hearing the patients history and performing a physical exam. On physical exam one of the most tell tale signs is instability at the 2nd MPJ while performing the Lachman test, which with one hand the physician stabilizes the metatarsal and with the other hand puts dorsal pressure on the toe checking the stability. Other signs are drifting of the toe in the sagitall and transverse planes and direct pain with pressing on the plantar plate. Many times MRI or ultrasound are used to confirm the diagnosis. What does surgery for the plantar plate tear involve? Surgery for the plantar plate tear involves making an incision on the top of the foot overlying the 2nd MPJ. The 2nd metatarsal is then cut and shortened in order to better see the plantar plate, but more importantly to correct the underlying biomechanics that lead to the injury in the first place. 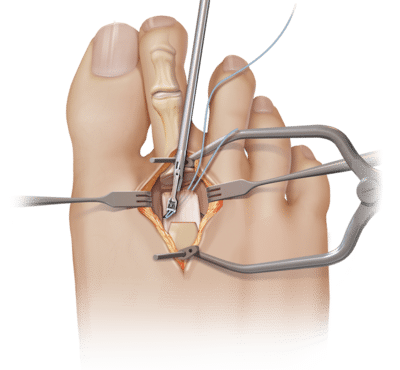 The plantar plate is then debrided and repaired/attached to the base of the toe using sutures passed through tunnels that are created in the bone. Although there is always a possibility of recurrence, it is a very successful procedure.